Zane Lowe doesn’t get paid get the big Steve Jobs bucks to ask artists basic questions on his Beats 1 radio. Today Migos—the rap trio behind such classics as “Fight Night,” “Handsome And Wealthy,” and “Bad and Boujee”—mentioned to Lowe that they’re looking to expand their creative output by making movies. Migos started rattling off a number of ‘90s rapper-meets-Hollywood moments that have inspired them, including Boyz N’ Da Hood and Juice, along with films created by Cash Money and No Limit Records. 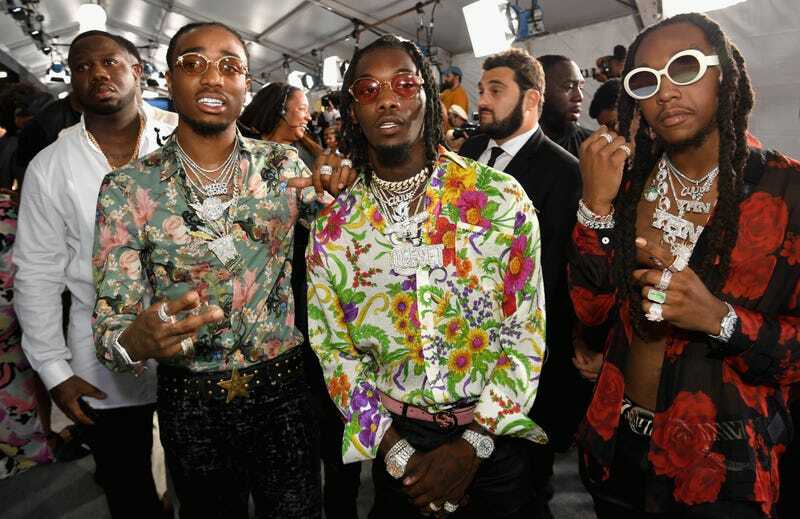 Last year, Migos made a splash when they appeared on the hit FX show Atlanta, which is why creator Donald Glover mentioned the rap group in his Golden Globes acceptance speech. Offset also let it slip that Quavo is working on writing a script. That got me thinking: What kind of scripts might the trio’s most popular member be working on? Based on the films Quavo mentioned, the most likely answer is a film loosely based on their own lives, where everyone is given slightly different names. Quavo is Sauvo, Takeoff is Holdon, and Offset is RemoveTable. Yes, “RemoveTable” is a horrible rap name, but creative license is important. Maybe Offset and Takeoff step back from the spotlight, and Quavo Ephron writes a remake of Sleepless in Seattle, featuring Cardi B and Quavo. Perhaps Quavo gets tapped to write Black Panther 2: The Nawfside, which given Marvel/Disney’s recent track record of pulling people on and off of projects, wouldn’t be too hard to envision. A PBS-style documentary on rap’s obsession with jewelry could be interesting. An indie film, wherein Migos play turn-of-the-20th-century cowboys making their way across the West, could be fun. Personally, I think Quavo bringing back the long forgotten HBO series Rome shouldn’t be off the table. Togas, lions, Takeoff. Win, win, win. Maybe even The Sopranos would be good for a Migos reboot, if we’re mining through shows that existed before the age of peak TV. Realistically, Quavo’s probably writing some kind of action movie. “Is it more Bourne Identity or Bad Boys?” is a question I’m sure that keeps Quavo and his writers room up late at night thinking, into the early morning hours. A remake of Friday, where Quavo takes on Ice Cube’s role, could be a solid career pivot once rap stops being as fun as it is now. Lastly, some of the best Instagram stories from earlier this summer, came from when the Migos were in Europe visiting a zoo, so it’s easy to imagine the Oscar speech he’ll give for his inevitable masterpiece: Quavo Bought A Zoo. Not be confused with QuavZoo, which is a limited series in which animals become hyper-intelligent and Quavo is the only one who holds the secret to keeping animals from destroying human society.